Manufacturing | Industrial Plants | Wi-Com Solutions Inc.
HOW CAN INTELLIGENT RADIO POWER SMART, CONNECTED MANUFACTURING? 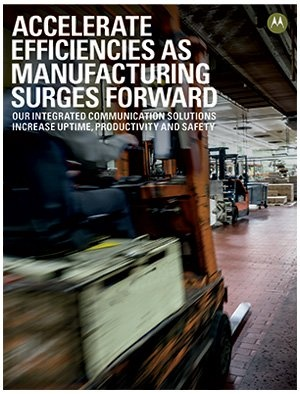 Manufacturers require a communication tools that increase productivity, reduce downtime and of course worker safety. Employees should be able to connect with other departments fast and efficiently. Factories, and other manufacturing environments are known for being loud, noisy and sometimes chaotic. 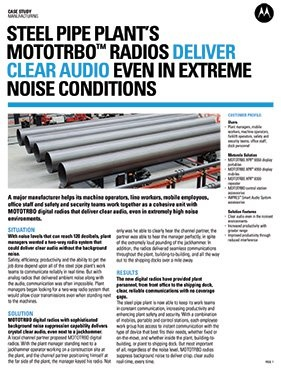 Motorola two way radios are build with manufacturing in mind are made with features like noise canceling technology. Wi-Com Solution pairs with the top manufacturers in the wireless communications industry to provide, service and maintain effective communication for all crew and personnel. The Most Intelligent and Durable Tools for Your Workers and Machines. Your industry relies on constant communication, allowing your workforce to increase productivity, safety and security. You hired the best team, let us provide them intelligent communications solutions that close the gaps in your operational efficiencies. We work tirelessly with your team to understand each of your unique operations, providing you with the essential tools that are customized to you, because when you win, we win! By combining the best of two-way radio functionality with the latest analog and digital technology, the CP200d is perfect for the everyday user who wants to stay connected. It is fully compatible with the MOTOTRBO family of radios and has superior audio quality, outstanding coverage, long-lasting battery life and more. You can also choose the analog-only model, which gives you great voice communications today with the option to migrate to digital when you are ready. Durable, fail-resilient, dependable – shop radios and accessories now.